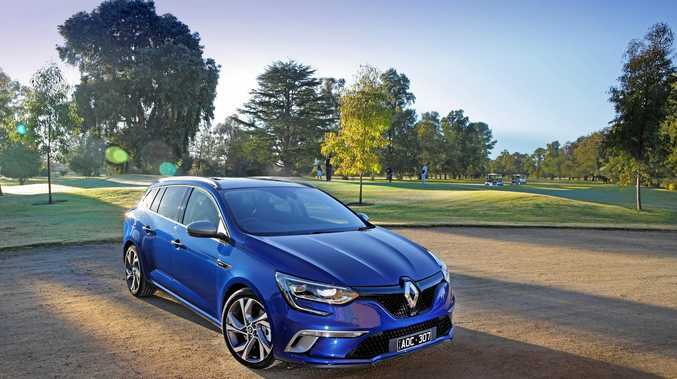 The Renault Megane GT Wagon is available for $42,490 drive-away. UNADULTERATED fun. 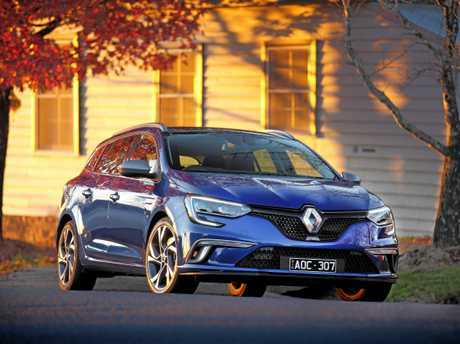 The Renault Megane GT Wagon defies the boredom tag often associated with load-luggers. 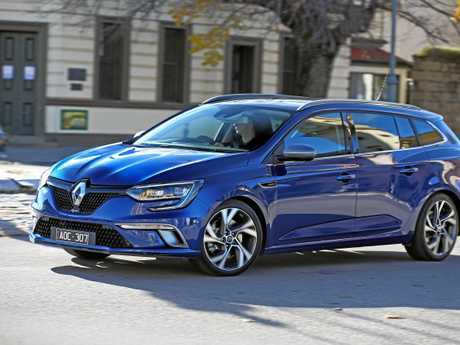 The five-door harnesses a racing heritage courtesy of the Renault Sport division, which has given the wagon some extra oomph and cool kit. For all those already discounting the Megane in favour of an SUV on the grounds of space - you're kidding yourself. While small in stature, this wagon trumps some much bigger offerings with a cavernous boot. So for families who want some Euro flair with an ability to throw in a heap of gear and do the groceries with ease, then this is a true SUV alternative that boasts sporting personality with a drive-away price of $42,490. The GT is the range-topper, so it gets a 8.7-inch vertical touchscreen with full phone and audio bluetooth connectivity, heated front sports seats with black and blue Alcantara upholstery, 18-inch alloys, semi-automatic parking, dual zone air con with vents for the back, smart key with automatic locking when you walk away and steering wheel paddles. The 'sunroof pack' includes an automatic dimming rear view mirror and sun visor with illuminated mirror costs an extra $1990, while the 'premium pack' with Bose audio system and LED headlights is $1490 and metallic paint is an extra $600. Capped price servicing is available, $897 for three years with intervals annual or every 30,000km. That covers the cost of all genuine parts, lubricants and labour required. The warranty period is longer at five years, with roadside assist for the same time frame. Slide into the Alcantara sports seats and it's a love hate relationship. Depending on body size and dimensions, they can be amazingly comfortable or awkward. Large bolsters at the side promote a high arm position for the driver, which means dropping your hands to a more relaxed position on the wheel while on the highway or when stopped can feel squashed. Head and leg room is good in both rows. Operationally the Megane doesn't have the same quirks as previous Renaults. 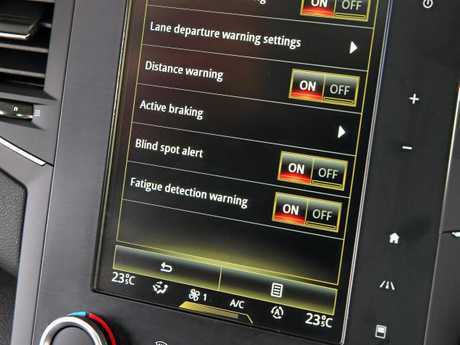 There is still the large credit-card looking key, the cruise control and speed limiter button is positioned on the console, and driver's stereo controls are hidden on a fat stalk behind the steering wheel. Once you know where they are all located the wagon is easy to live with...it's just gaining the knowledge before you hit the road. One item missing from the specification list is smartphone mirroring apps Android Auto and Apple CarPlay. 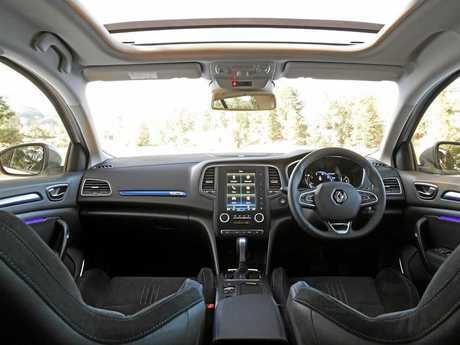 The Renault system can be difficult to navigate and time-consuming to find your way through the infotainment options. You really need to configure it to your preferences to save time and avoid taking your eyes off the road. The Renault Sport makeover means more than just the honeycomb grille and lower front bumper, along with a rear diffuser. Mechanical changes over the standard Megane include a more athletic chassis and suspension set-up, launch control, multi-downshift gear change functionality along with beefier brakes for improved stopping power. Lively without being a raging charger, it's an enjoyably engaging drive. 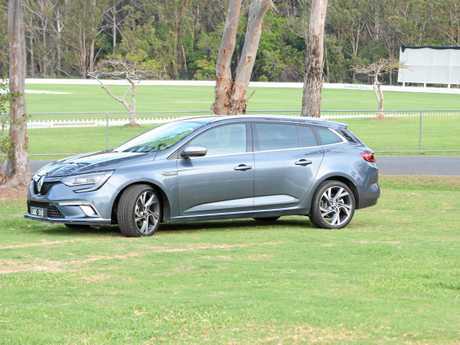 Turn aggressively and the Megane Wagon's four-wheel steering comes to the fore. It feels like you can drive from the hips. 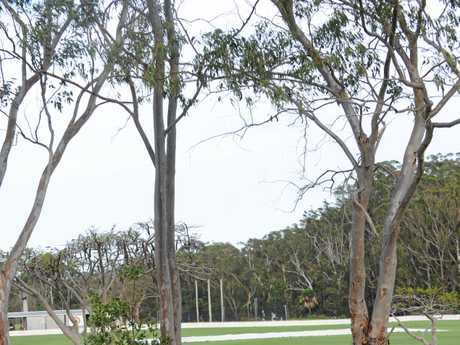 As you swing into a bend it grips, bites into the bitumen and turns with precision. 4Control steering turns the rear wheels in the opposite direction to the fronts at moderate speeds to sharpen turn-in response dramatically. Jump on the right pedal when the light goes green and it's a spirited response. It feels quicker than the 0-100km sprint time of 7.4 seconds. On occasions there is a hint of torque steer, where you feel a tug on the thick sports steering wheel, with a reasonable amount of power churning through the front wheels. 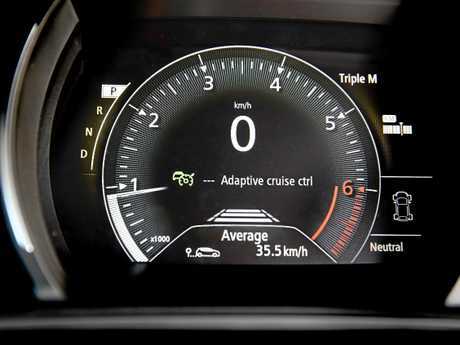 Among the inclusions are emergency braking, lane departure warning, automatic high/low beam headlights, adaptive cruise control and distance warning as well as side, front and rear parking sensors. Unfortunately it misses out on blind spot assist, which is on the GT-Line variant. With 580 litres of space, the boot space is actually bigger than a Audi Q5 (550 with the seats back), Lexus RX (466), Honda CR-V (522), Mazda CX-5 (442) and Kia Sportage (466). It even trumps the old Ford Falcon (535) and the soon-to-be replaced Holden Commodore (495). Swift wagon which doesn't have as much boot space, but similar dynamics. SKODA OCTAVIA RS (from $37,890). Impressive equipment list and rewarding drive...although no quite the same pizzazz. Strong all-wheel drive performer and the primary rival. Renault has worked hard on aftersales aspects of its business. That has translated to improved customer support, and better access to parts which means you shouldn't be waiting weeks to have your car fixed. It's adds up to more buyer confidence, and this wagon is brimming with good looks, great performance and a solid features list. ENGINE 1.6-litre turbocharged four-cylinder 151kW/280Nm. TRANSMISSION Dual clutch seven-speed automatic, FWD. THIRST 6.0 litres/100km (combined average). 0-100KMH 7.4 seconds, top speed 230kmh.